Learn how bute, Banamine and other equine pain relievers work, their side effects and more. After a long trail ride, sore muscles or nagging joint pain may prompt us to take an aspirin or another type of non-steroidal anti-inflammatory drug (NSAID) without much thought. These medications are the standard go-to when it comes to mild aches and pains; for our horses, it’s no different. Phenylbutazone (bute) and flunixin meglumine (Banamine) are the two most common NSAIDs used in horses. It’s important for horse owners to know how these drugs work, their potential side effects, and how to safely use them. To understand how NSAIDs such as bute and Banamine work, we first have to understand pain and inflammation. When your horse is injured, the damaged tissue releases many different types of chemicals into the surrounding tissue and blood stream. Some of these chemicals cause inflammation, and others attract white blood cells to fight infection. One type of chemical that is released at an injury site is called prostaglandin. There are many different kinds of prostaglandins, and they perform a wide range of functions. Some cause tissue swelling, inflammation and pain, while others bring on fever. However, not all prostaglandins are involved in pain. Many are needed for day-to-day organ function and maintenance; some are required for reproductive purposes. NSAIDs work by inhibiting the enzymes the body needs to make prostaglandins. These enzymes are called cyclooxygenases. Currently there are three known types: COX-1, COX-2 and COX-3. If your horse isn’t making as many prostaglandins, then pain, fever and inflammation are reduced. Bute and Banamine are referred to as general COX inhibitors. This means they inhibit all COX enzymes. It has been shown that primarily COX-2 is involved with forming the prostaglandins that produce pain and inflammation, whereas the role of COX-1 is more protective in nature. The COX-1 enzyme is involved in many normal bodily functions; for example, the production of protective gastric mucus. COX-3 has a role in the development of fever at the level of the brain. Although bute and Banamine are both NSAIDs and work as general COX inhibitors, each drug works best in different situations. Bute is more effective for orthopedic pain, such as with osteoarthritis or ligament and tendon damage. Banamine is beneficial for abdominal pain, such as colic, and fever reduction. This is why Banamine is normally administered to a colicky horse and bute is more commonly used for arthritic horses. Another NSAID available for horses, firocoxib (trade name Equioxx), is different from bute and Banamine in that it is a selective COX-2 inhibitor. This means it only prevents the production of COX-2, leaving COX-1 alone to continue helping with normal body functions. Like bute, Equioxx is best used for osteoarthritis pain. Diclofenac (trade name Surpass) is an NSAID formulated for topical use for relief of pain due to osteoarthritis. Since bute and Banamine both decrease COX-1 as well as COX-2 and COX-3, there is the potential for the horse to develop gastric ulcers on these medications. Remember that COX-1 is needed for the production of the protective mucus lining of the stomach. Gastric ulcer formation is one of the most common side effects of bute and Banamine, and is primarily seen in cases of prolonged NSAID use. Because firocoxib leaves COX-1 alone, gastric ulcer formation is reduced. Veterinarians frequently choose firocoxib for horses with a history of ulcers. Decreased blood flow to the kidneys is another side effect of NSAIDs that are administered orally or via injection. In a dehydrated horse, unmonitored use of NSAIDs can lead to destruction of the sensitive cells inside the kidney. This is a very serious condition that needs immediate veterinary care. When a dehydrated horse is given NSAIDs—for example, in a case of equine influenza with a high fever or a severe colic—your veterinarian will carefully monitor your horse’s kidney function with blood tests. Intravenous fluids are usually administered concurrently to help rehydrate the horse. High doses of NSAIDs can also cause inflammation of the colon. Called “right dorsal colitis,” this irritation of a particular segment of the large intestine can lead to chronic diarrhea and subsequent loss of nutrients, such as protein. Right dorsal colitis can be difficult to manage medically, with some cases requiring surgical removal of the affected portion of intestine, or even euthanasia. Although the potential side effects of NSAIDs may sound scary, don’t forget that these drugs are extremely beneficial when used responsibly. Helping to reduce pain and fever is important for a horse’s quality of life and can speed up recovery from illness. Once a horse’s fever is brought down through the proper use of an NSAID, he’ll begin to feel better and start eating again. One of the most important things to remember when giving NSAIDs to your horse is that these are prescription drugs that should be obtained and used under the guidance of your veterinarian. When your vet is familiar with your horse and the particular situation requiring the use of an NSAID, she can best instruct you on how to administer the drug safely. Both bute and Banamine are available in oral and injectable formulations. 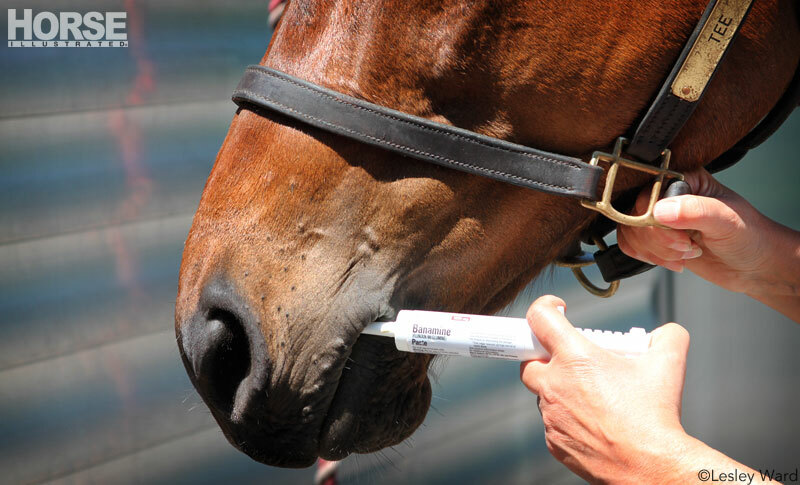 Oral administration is best for horse owners, since it doesn’t require the use of needles. Most frequently, bute is offered as a tablet or powder that can easily be mixed in feed or hidden in a treat. Banamine is commonly available in paste form and can be administered like you would give a dewormer. Equioxx also comes in paste form. Your veterinarian should be there to administer NSAIDs intravenously (IV). This allows the drug to immediately enter the bloodstream and begin working quickly and efficiently. This is important in cases where rapid pain or fever control is needed, and when the horse is not eating, such as with colic. Bute should never be given as an intramuscular injection (IM). This NSAID is extremely damaging to muscle tissue and can result in necrosis, or tissue death. Only experienced people such as your veterinarian should administer IV bute so as not to get the drug outside of the blood vessel. Injectable Banamine should only be given IV as well. While not as toxic to muscle tissue as bute, IM Banamine injections can result in injection site abscesses or even Clostridial myositis, an extremely dangerous bacterial infection. Surpass is a specially formulated cream for topical application so that it can be applied directly to the skin over an affected joint. Wear gloves when applying it, and never administer it orally. When your veterinarian prescribes an NSAID for your horse, let her know if your horse is on any other medications or has recently received steroids. Administering multiple types of NSAIDs at the same time can increase the likelihood of side effects. Using an NSAID at the same time as a steroid, such as dexamethasone or prednisolone, is also not recommended for the same reason. Before giving your horse an NSAID in an urgent-care situation, call your veterinarian. If she is coming out the same day, she may recommend not giving it until she arrives. The reason for this is to prevent masking a lameness, fever or other symptoms (such as colic) prior to your vet’s physical exam. If prolonged use is warranted, make sure your vet knows your horse’s management routine and habits. For example, if a horse has a history of gastric ulcers, your vet may recommend management changes to help prevent this side effect, or place your horse on ulcer medication. NSAIDs are frequently prescribed for use in osteoarthritis on an as-needed basis for the occasional stiff or “off” day. Make sure you understand dosing in these cases. Additionally, minor chronic aches may be managed at a lower dose. Since NSAIDs are given on a bodyweight basis, be aware that a 1-gram tablet of bute may be appropriate for a Thoroughbred but not for a Shetland pony. Long-term, low-dose use of an NSAID may be necessary for certain chronic conditions. High doses over the long term, however, can increase the risk of side effects. Talk with your vet to understand what doses are considered high and low for your specific horse. 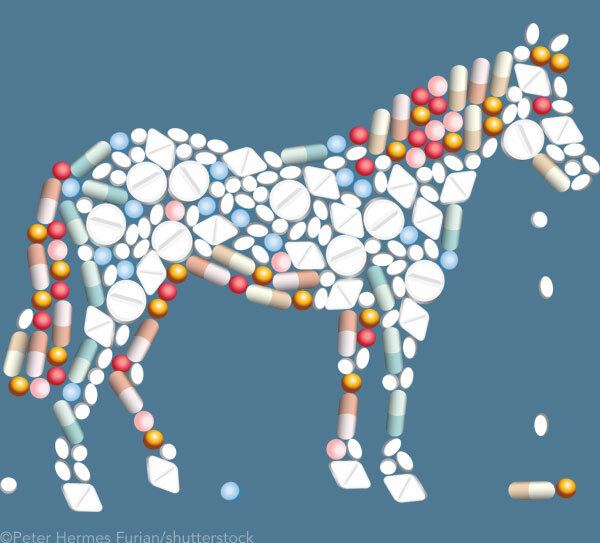 NSAIDs are some of the most common medications given to horses. From managing chronic lameness to providing relief during an episode of colic, these drugs offer respite when our equine companions are in pain. Understanding the uses and side effects of these drugs can help you safely administer them to ensure that your horse receives the greatest possible benefit. This article originally appeared in the August 2014 issue of Horse Illustrated. Click here to subscribe! Wonderful article. It’s always good to know these things.